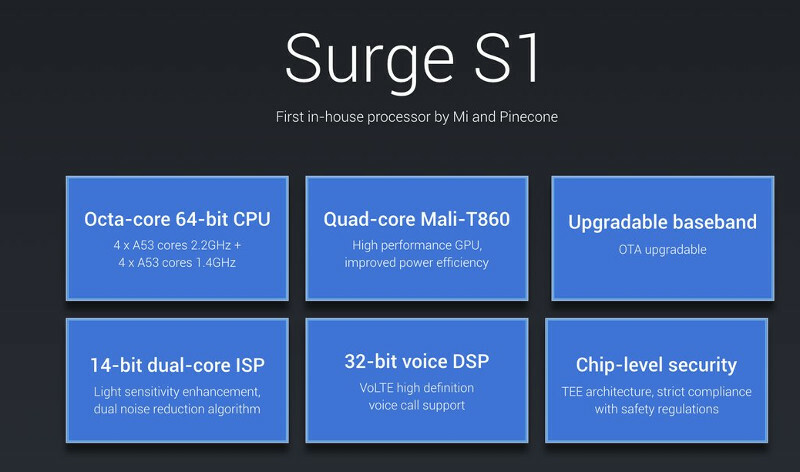 After establishing Pinecone in 2014, Xiaomi has finally launched its first in-house SOC called Surge S1. It is a 64-bit octa-core chipset with four ARM Cortex A53 cores 2.2Ghz and fours ARM Cortex A53 cores clocked at 1.4 GHz. big.Little approach is implemented so that the higher clocked cores take care of intensive tasks; whereas, underclocked and less powerful cores are used for simple tasks. To put in perspective, the Qualcomm Snapdragon 625 comprises of eight ARM Cortex A53 cores clocked at 2.0GHz. Surge S1 has quad-core Mali-T860 GPU on board. The same GPU can be found on chips like Helio P10 and Helio P15. It is manufactured using 28nm High-Performance Computing (HPC) process. The Surge S1 has 32-bit high performing DSP for better voice-processing and 14-bit dual ISP for image processing. Xiaomi claimed that Surge’s ISP algorithm improves camera light sensitivity by 150%. The chip also supports VoLTE calling. The CPU and GPU specifications reveal that the processor will be used on budget and mid-range phones. However, the Antutu score of 64,817 is praiseworthy. With this chip, Xiaomi has joined the elite list of smartphone manufacturers like Apple, Samsung, and Huawei, which manufacture their own SOCs. Xiaomi may become more aggressive with pricing if they use these chips on the phones released in international markets. The just-announced Mi 5c will be the first phone to use this SOC.